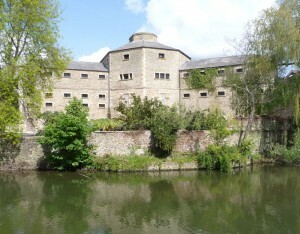 It is exciting to drive past the Old Gaol in Abingdon and see the work that is happening to convert the former Napoleonic Prison by the river in to flats and restaurants. Many residents of Abingdon will remember the Old Gaol as a sports centre, which closed in 2002. It is such a striking building, and it is inspiring to hear about the plans to develop it in to something which really will be for the whole community. Work has already started on the underground car park, and then they will move on to developing the building in to energy efficient apartments, with solar power, grey water recycling and “green” roofs. The location is great as it is in the town centre, but it is also good for access to Didcot Parkway, the European School and the nearby Science and Business Parks. This is very much a project for the community of Abingdon, which is why this will be a ‘mixed development’ rather than pure housing. There will be 15,000 ft﻿² of restaurants, an open-air theatre and access to the river and gardens for all local residents. The developer, who spoke at our recent event (Property Intelligence), says: “We tend to stay away from private, gated developments and we prefer to retain access through our schemes as it keeps it lively. We look forward to updating you as this development continues.